Victaulic’s Style 171 flexible composite pipe coupling is an engineered composite coupling for use where corrosive conditions exist. Ideal for reverse osmosis (RO) skids in vertical and horizontal installations, the Style 171 enables quick and simple installation and provides substantial gains in productivity. Featuring Victaulic installation-ready technology, the Style 171 eases and speeds installation. The Style 171 does not require disassembly prior to installation; the coupling is simply pushed onto the pipe end as a fully assembled unit and tightened using standard hand tools. 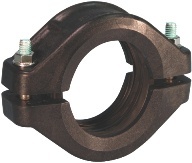 The coupling’s design reduces labor hours to complete system installation, eliminates loose components that could be dropped or lost, and reduces installation clearance requirements. The Style 171 creates a flexible pipe joint, accommodating expansion, contraction, and deflection in the piping system. The injection molded engineered composite housing offers corrosion and UV resistance, and is lighter in weight than ductile iron and stainless steel couplings. The Style 171 coupling can be used to join standard roll- or cut-grooved PVC and cut-grooved HDPE pipe, and can also be used on stainless steel and FRP. The Style 171 is available in 1½ to 4-inch (40 to 100 millimeter) sizes, and can withstand pressures of up to 150 psi (1,034 kPa), depending on pipe material and wall thickness.